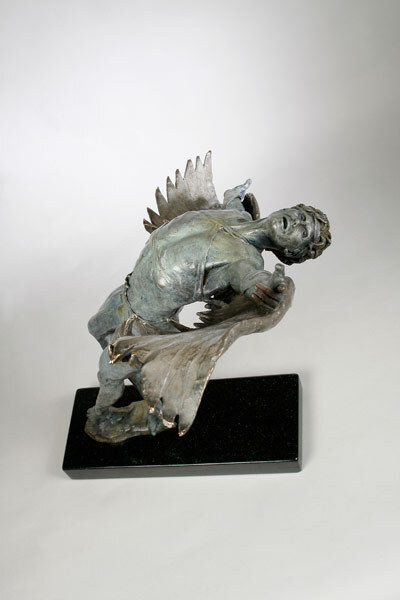 There have been three images cast of Icarus falling to Earth. Each one is a little different to the others as much of the creation takes place at the wax step in the casting process. The artist reserves the right to cast up to five in the edition plus one Artist Proof. It is unlikely however, that more than the three existing images will be cast. Greek mythology has it that King Minos confined Icarus and his architect father Daedalus on the island of Crete. This was due to Daedalus having helped Theseus escape the Labyrinth after slaying the Minotaur and then run off with Minos’s daughter. The Minotaur was the half man, half bull offspring resulting from Minos’s wife’s liaison with a bull she fancied. The Minotaur had been confined in the Labyrinth. 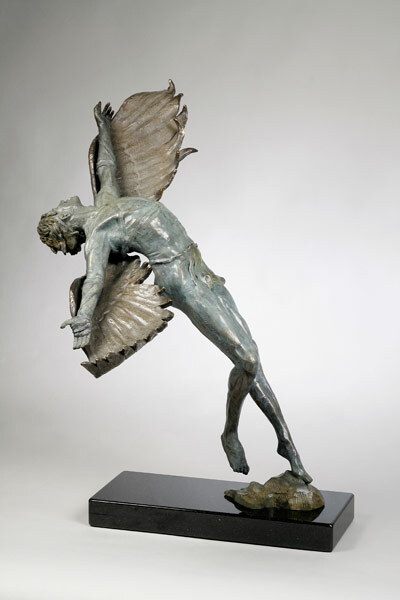 To escape, Daedalus built wings for himself and Icarus, fashioned with feathers held together with wax. Daedalus warned his son not to fly too close to the sun as it would melt his wings, and not too close to the sea, as it would dampen them and make it hard to fly. 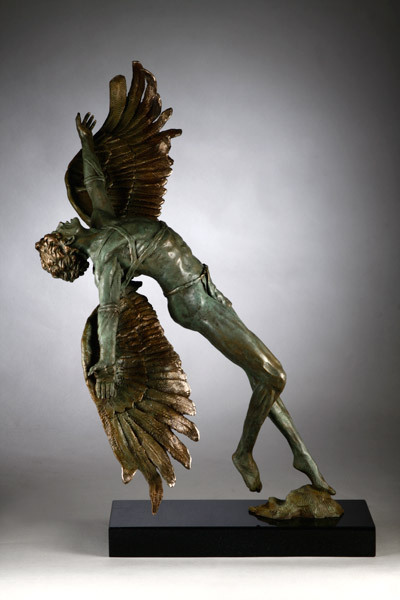 They successfully flew from Crete, but Icarus grew exhilarated by the thrill of flying and began getting careless. Flying too close to the sun god Helios, the wax melted from the heat and he fell to his death, drowning in the sea. The Icarian sea, where he fell, was named after him.